Before you arrive you should have made all the preparations noted in the Crew Checklist. You will need to list your Family User Name, Scout Troop/Venture Crew Number, College or University, the Airline and the flight number for your journey to and from Marsh Harbour and your arrival and departure times. Please email us this information 30 days prior to your arrival. When your crew arrives at Marsh Harbour International airport you'll clear Customs and Immigration. When you complete your Immigration form you should note that you're on a 'Sailing Vacation' and you should write 'Conch Inn Marina' in the box where it asks for 'hotel name or intended address'. When you've collected your baggage, your group will then take a minivan taxi to the Curly Tails Restaurant car park (not the 'Dive Abaco or Conch Inn' car park). Although we'll be monitoring your flight arrival status, be sure to ask your driver to call Sail School Bahamas on vhf Ch65 to confirm you are on your way to the marina. 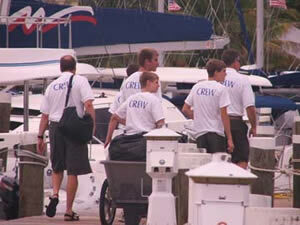 Our staff will meet you at the Curly Tails car park in front of the marina. If you have any documentation for us we can collect it at that time (remember you can scan and email paperwork to us in advance). You'll then be introduced to your Captain and shortly after you arrive you will head out to your sailboat. Before you arrive we'll allocate a sailboat(s) to your crew and this will be confirmed by email along with your arrival instructions. Space onboard is limited so pack sparingly and only bring ONE bag per person. Use soft luggage only - bags should be no longer than 28" - 30". DO NOT bring suitcases. (It's okay to bring your snorkeling gear in a separate bag). Check the Packing List section. You'll be able to board your sailboat after 10:00hrs. You'll be expected to be off your sailboat by 10:00hrs on the day your trip ends to allow time for the Captains to reprovision and carry out maintenance. Your Captain will take you to your assigned sailboat then provide a safety & orientation briefing specific to your sailboat.